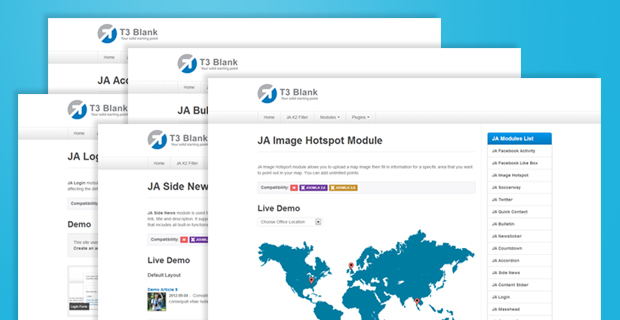 The Extensions Demo site is built on T3 Framework and is using T3 Blank template. We use T3 Blank template as a base to build extension demo on because by this way, you can see exactly how our extensions work and function on our Joomla templates, you get what you see. The demo site detail page also have backend screenshots of extension, so as to give a clear idea of backend settings of the extensions. In addition, there are links to Forum download and Documentation for each demo. So, take a tour around our Extensions Demo and get yourself an overall view of what you can get out of our Joomla Extensions Club.